The Fuji 16mm f/1.4 R WR represents the latest fast prime lens to be added to the Fujifilm X lineup. There are now four prime lenses that feature apertures f/1.4 or faster spanning from super wide to short telephoto. Unlike the other Fuji X primes, the 16mm f/1.4 is the first weathersealed prime lens in the Fuji lineup, and it fills the niche for a fast super-wide lens. The 16mm f/1.4 has the same field of view as a 24mm lens on a full frame camera, and so is useful for a very wide range of applications, from landscape and architecture to environmental portraiture. Can this lens hold its own with the other excellent Fuji primes? The 16mm f/1.4 R WR shares its design philosophy with the established Fujinon XF lenses, and most closely resembles the 23mm f/1.4, though as you’ll see below, it’s slightly longer and slightly larger in diameter. The overall construction is excellent, with an all metal exterior shell and lens mount, and a solid and smooth focus clutch mechanism for manual focus. Perhaps it’s due to the size, or perhaps some small changes that are individually hard to pick out, but the 16 mm f/1.4 feels like the most solidly constructed Fuji lens I’ve used, even if only by a hair. The Fujinon XF 16mm f/1.4 is slightly larger than the 23mm f/1.4 and 56mm f/1.2, but maintains a similar construction and feel. 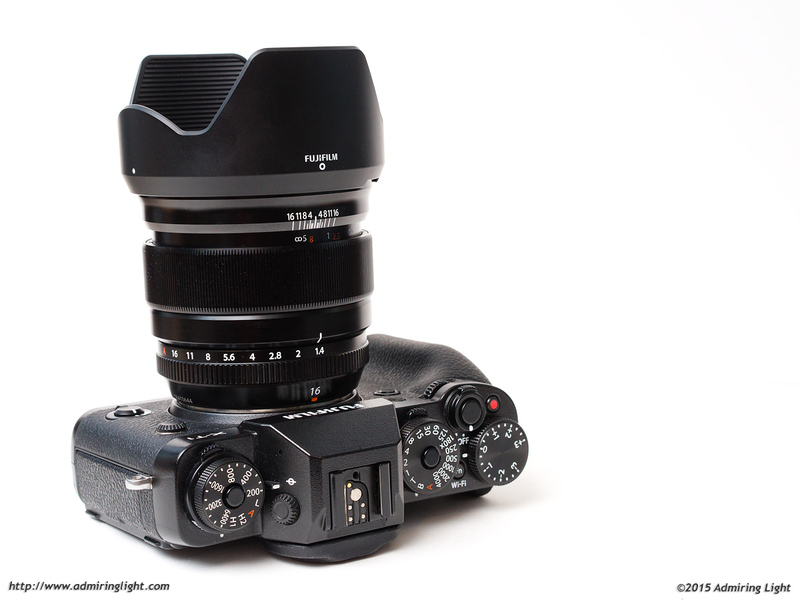 Despite the slightly larger design, the lens handles as well as any of the other fast Fuji primes. You’ll probably want a camera with a bit of grip, so the X-T1 or X-T10 would work very well. The other Fuji X cameras will work beautifully too, though I’d recommend one of the add-on grips when shooting with the 16mm, just to make things feel a bit more balanced. The 16mm f/1.4 WR is the first weather-sealed Fuji prime lens, and so features a rubber gasket at the lens mount and some internal sealing as well to help resist water and dust. I didn’t shoot in any particularly heavy rain conditions, but I did shoot with it during a passing shower for a short time, and the lens performed admirably, with no apparent intrusion of water into the lens or camera. The lens comes with a petal shaped lens hood that reverses easily on the lens and snaps confidently into place. The hood provides good shading and front element protection without being overly bulky. The focus ring on the 16mm f/1.4 features the same focus-clutch mechanism found on the 14mm f/2.8 and 23mm f/1.4. Pull back the focus ring to enter manual focus mode, and you get a full distance and depth of field scale and hard stops at either end of the range. Note that on newer camera firmware versions, you must also select manual focus on the camera before it’s enabled. The focus ring is smooth to operate, though damping is light. The lens also has an aperture ring like most of Fuji’s lenses, and in continuing the tradition of varying aperture ring resistance, it is a looser ring than the recent WR zoom lenses, and has a similar feel to that of the 23mm f/1.4. 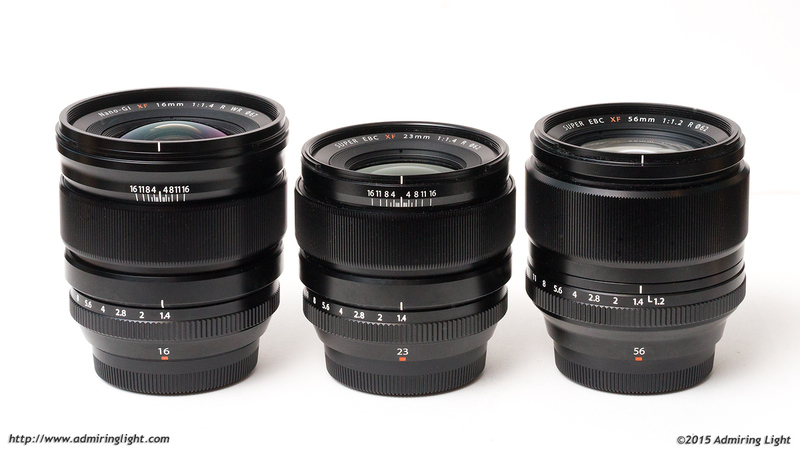 I’m not sure why Fuji can’t decide on a ring resistance and use that for all of their lenses. It can’t be that hard to do. There are loose rings like the 14mm f/2.8, slightly tighter like on this lens and the 23mm, and stiffer rings such as the 60mm macro or 16-55mm f/2.8 and 50-140mm f/2.8. Personally, I’d like all of the rings to operate similar to those on the f/2.8 zooms, which have the perfect blend of resistance and ease of use. The 16mm f/1.4 doesn’t feature one of Fuji’s quietest linear motors like many of the zoom lenses, but the autofocus performance is quite good nonetheless. Focus locks on swiftly and very quietly. There is some noise if you really listen for it, but unless you are in an exceptionally quiet room, you won’t hear it during normal operation. Focus accuracy was very good, and I don’t believe I had a single misfocus during the testing period. Focus does slow somewhat in lower light, like all the Fuji lenses, but the speed remains usable in these conditions. With regards to the aperture ring I’m guessing it’s simply sloppy manufacturing tolerances. I picked up my 16mm last week and the ring is perfect! Tighter than my 14mm and 23mm, it even feels better than my 56mm. After picking up the 56 I was disappointed that my copy of the 23 is a bit loose but I heard from others that theirs are perfect. When I pulled the 16 out of the box and felt how perfect the ring resistance is I thought maybe Fuji have finally nailed their process. After reading your very thorough review I’m disappointed to hear that is not the case. The 16mm had replaced the 35mm as the default lens for my X-T1–something even the 23mm wasn’t able to do, and it bumps the 56mm off the best build feel pedestal. Too bad they’re not more consistent on that aperture ring. Yes, I agree about the sloppy aperture rings. 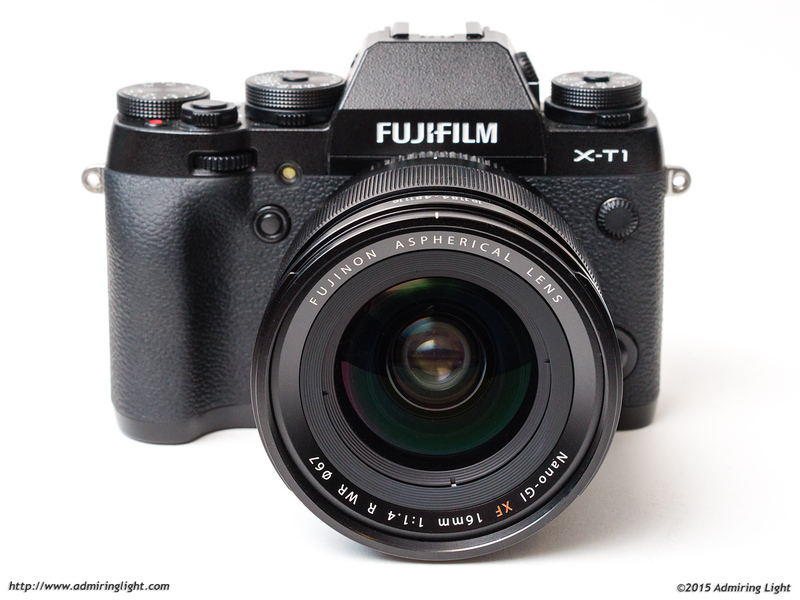 I bought the Fuji X-T1 along with three lenses, the 14mm, 35mm, and 56mm f/1.2. I could not believe at how loose and poorly fitting these rings were and returned the whole system. I really enjoy the use of an aperture ring but not if it is as sloppy as Fujifilm’s are. I’ll do without instead as I replaced the Fuji with a new Sony A7. Thanks for the review. Can you please let us know how it performs for infrared – any hotspot ? Unfortunately, I don’t have any IR converted Fuji X cameras. If you have an infrared filter, like Hoya R72, you can still test as the Fuji’s allow a good enough portion of IR to go through without the need to convert. Otherwise no worries. Also, how does the lens compare with the 16-55 which you recently reviewed ? Can you tell any noticeable color/contrast/sharpness difference ? Thanks! Thank you for this excellent review! As a new Fuji X photographer, I have the awesome Fuji 16-55 f/2.8 zoom as well. Afragisk, I too, was wondering how that zoom at 16mm compares to this prime at 16mm…I realize the prime should be better in terms of sharpness, but that 16-55 is the highest-quality zoom I’ve ever had the pleasure of using, and I’ve used everything from Nikon to Olympus to Pentax. Thanks again! 14-24 2.8: Get the Nikon and a body if it’s that critical uenlss you’re not pro and/or you can’t afford it in that case, get a job 100-400 replacement: Borrrinnnggg! A 400 5.6 IS is a bit more interesting though.24-70 IS: Yes you can’t compete with other photographers without this lens, right? Oh wait a minute no one has one!135 1.8 IS: Again, if it’s that important, pick up a cheap a850 and a ZA 135. That lens is very nice too (from personal experience). Surely if Canon made that entire list of lenses you mentioned available, you wouldn’t go running to the shop to bag all of them at once, right?200-400 f/4 IS: Another boringggg lens have you used the Nikon one? Take it from me it is boring, heavy and for that 200-400 range, there are faster aperture, better lenses that’ll do the job much better again, that is if you care about the shots. If you don’t care about aperture or you’re too lazy to carry the best gear then why not get a 50-500 OS instead?50 1.4 II: Ok no manufacturer has made a perfect fast 50, so there’s always room for improvement.85 1.4: Have you tried using the 85 1.2 II? Anyone who has won’t complain. It’s better at 1.2 than all the current 85 1.4s out there. Plus the slow AF talk is pure BS and I got the shots to prove it. Very good reviews and great pictures! well done Jordan. I’ve just discovered your blog and went through some of your Fuji reviews. I’ve been a proud owner of a Nikkor 85mm f/1.4 Ais (and a 28mm f/2 and Nikon FE2 for about 30 years now and it is still an indestructible, but heavy beast. Problem is this overall kit is quite heavy on the neck! and I’m not getting younger. So, I’ve never really been bugged as with my old timer and the reason was: I hate fiddling through a menu on a screen just to get the exposure right. I’ve been wishing for many many years to get a “real” camera with the usual dials for quick access to manual controls just has they did in the older time, when things were simpler, and particularly now that I need glasses for reading! I’ve discovered these Fuji cameras and I am really very tempted to get back to real photography, sadly it will be not with Nikon. I was going for the XE-2 until I saw your review and changed my mind for the XT-10. And I will buy first a wide angle, and here I am hesitating between the Fuji 16mm f/1.4 and the 14mm f/2.8. This is a difficult choice, the pictures you took with the 14mm are really great, but I reckon the 16mm should offer more latitude with its low light capability… but I don’t know, they both look good. When using my Nikon gear, I was only using my 85 and the 28 (no zooms, no 50mm, nothing else really…). But I found the 28 was still not wide enough. I love to take pictures of people / portraits / architecture / landscapes / street photography / light and bokeh… in color and B&W. I will definitely go for the 56mm F1.2 later, but the question remains open for the wide angle: 16 or 14? How does the 16 1.4 compare (performance wise) with the fuji 16-55@16mm? I know they have somewhat different uses,but I’m primarily interested in their performance as landscape lenses. Thanks. The 16-55 is a good lens, but the 16/1.4 is among Fuji’s best primes…it is definitely the better optic, especially when concerning edge and corner sharpness. Thank you very much; would you still consider the 16-55 to be suitable for shooting landscapes when printing at decent sizes (16×24 and smaller)? I know you mentioned it can have some problems when focusing at long distances. Sorry if you would prefer me to post this on the 16-55 review; I just wanted to keep the conversation together. Yes, I think it does fine. I have a 16×24 that I took with the 16-55 that looks great. Thanks; I guess I know what my next lens is(it’s the 16-55). I will say, if you don’t need the 16 and 17mm focal lengths, especially for landscape use, the good old 18-55mm is a better value. Similar image quality stopped down and you only lose a little bit on the wide end and a stop of aperture at the long end, but get a much smaller lens with OIS. The 16-55 is a bit better, but it’s not a huge difference, and for my uses, the 18-55 fits my needs better (even though I would like the extra width). I’ve considered the 18-55+ a wide prime, but I would much prefer to have weather sealing since I’m moving to Minnesota. Thanks for the review, Jordna. I rented this lens and immediately fell in love with it! I love the manual clutch focus and simply love, love, love this lens! Wide angle is my preference and even if people were to point out bad things about this lens, I don’t care. It is the most FUN I’ve had with a lens! Ever! Even if I don’t use it all the time, there is no way I’m giving it up. 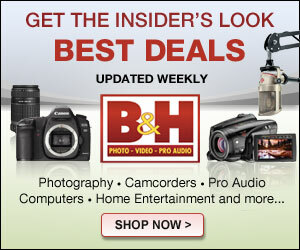 I have great wide lenses from Nikon but they are what they are. Tools. I have a love affair with this Fuji lens so I look for reasons to use it. Pingback: ??????????????? XF16mmF1.4 R WR??????? | ????????????? Thanks for the review. How does the 16 compare with the 23mm f/1.4 –if given a choice with just one which would you choose? I’m in the market for a new lens for my X-T20 and narrowed my choice between the two. Pingback: ????? ?XF16mmF1.4 R WR?????????????????????????? | ???????????? ?